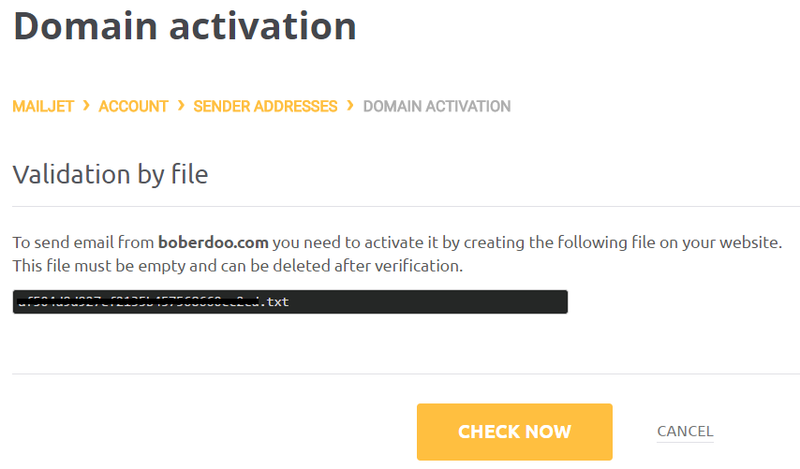 Are you looking to integrate a Mailjet account with Outbound Automation by boberdoo? You’ve come to the right place. 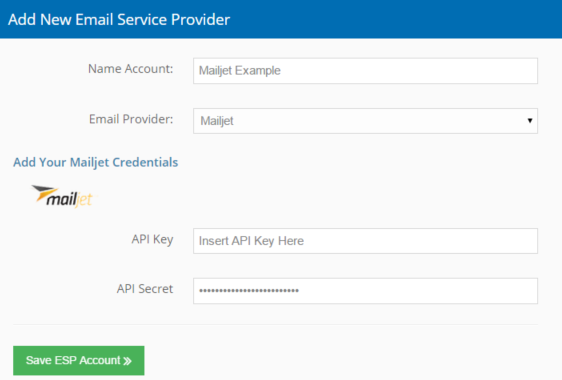 Mailjet is one of the top ESPs around and offers a limited free usage account as well. Follow the steps below to properly configure and integrate your Mailjet account with Outbound Automation. 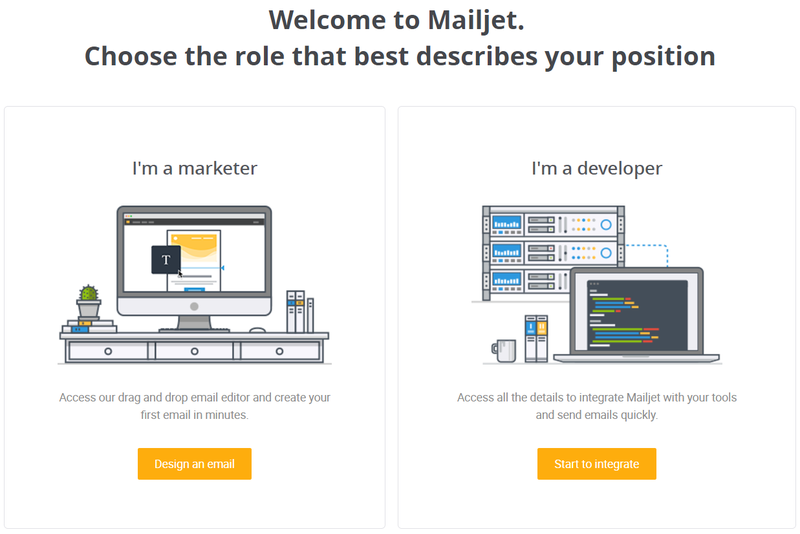 If you already have a Mailjet account, skip to step 2. If you’d like to set up a new Mailjet account, click the link above. Follow the instructions to get signed up and verified. The free account gives you 6,000 email sends/month, but limits you to only 200 sends/day. If necessary, you can upgrade your account after signing up. Choose the option on the right and click the Start to integrate button. Right away you’ll be greeted by your API Public Key (SMTP username) and API Secret Key (SMTP password). Copy these keys as you will need them to integrate with Outbound Automation. Next, you need to verify all domains that you would like to send through. Click the Manage sender domains and addresses link. If you have navigated away, you can find this link in the My Account section. Click the Add Domain button and add your domain. In order to verify your domain, Mailjet requires you to place an empty file on the root of your website. They recommend doing this via FTP. This allows Mailjet to perform a check, locate this file and mark your account as validated. Open an empty text file and save it. When naming this text file, copy and paste the exact string that Mailjet provides. When Mailjet performs their domain check, they look for this exact file name including the .txt extension. Finally click the Check Now button. If done correctly, your domain will be validated. If you cannot complete this step, Mailjet support can allow you to validate your domain via your site’s DNS. See instructions here. In order to maximize your email delivery, you must add a few records to your verified domain’s hosting account. To do this go to the My Account page and click Setup SPF/DKIM Authentication. Next, locate your domain and click the mange button. From this page, you will see instructions for how to add one SPF and one DKIM record through your domain’s hosting account. Go to your domain’s hosting account. If you don’t know what hosting service you are using, you can look it up here and find your hosting service in the Name Server(s) field. From your hosting account, locate the DNS records or the DNS Zone File. From here, add a new record. Value (No existing SPF record): If your domain does not have an existing SPF record, you can use the value in the IN TXT field. Value (Existing SPF record detected): If you domain already has an SPF record, you need to edit the existing record and replace the value with the string that appears in the IN TXT field in your Mailjet account. Hostname/Host/Name: Copy and paste the first line in the DKIM column from your Mailjet account. Value: Copy and paste the IN TXT value from your Mailjet account. Once you have added or updated these records, be sure to save all changes in your DNS. Finally, return to your Mailjet domain authentication page and click the Force Refresh button. This will check your DNS for these records. You are now ready to send. If your domain is not successfully authenticated, click the Force Refresh button again in a few hours. Some DNS changes can take up to 24 hours to propagate. 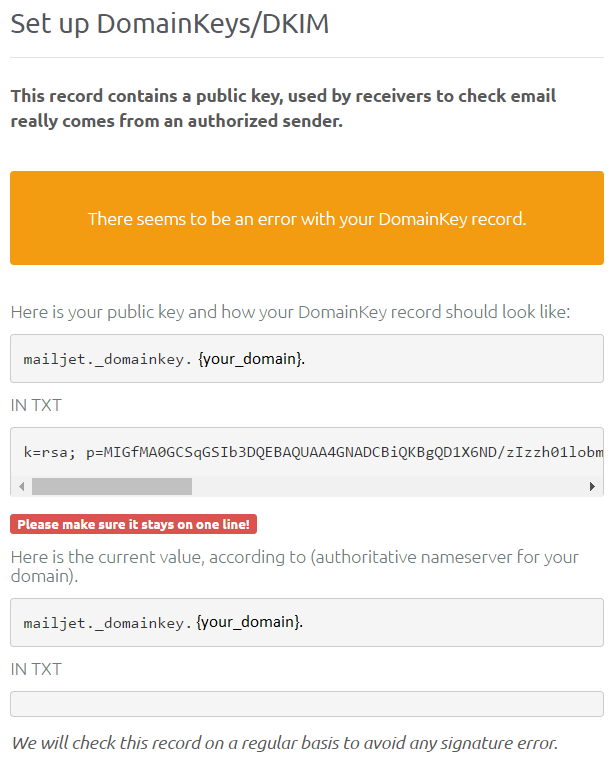 After retrying, if you domain is still not verified, see Mailjet’s authentication guide and verify your setup. 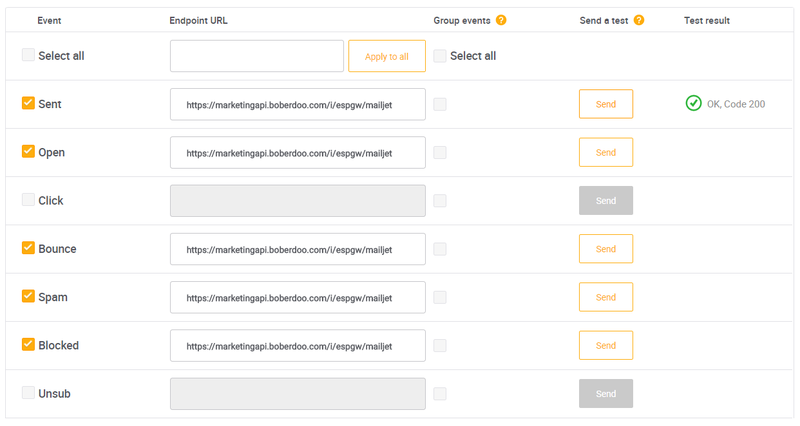 Next, you must enable event tracking within your Mailjet account so it can relay the correct information to Outbound Automation. In the upper right hand corner of your Mailjet dashboard, select My Account. In the Rest API table, select Event tracking (triggers). You can even click the Send button to send a test notification. Finally, click Save. For this step, you will use the API Public Key (SMTP username) and API Secret Key (SMTP password) from step 2. If you did not copy these keys, you can retrieve them from My Account>Master API Key & Sub API key management. First, head to Oubound Automation and click the Setup tab. From here, locate the Email Service Providers box and click the green Add New ESP button. Select Mailjet from the Email Provider dropdown and choose a name for your ESP. This name will be used for internal reference and organization only. Finally copy your API Public Key (SMTP username) and API Secret Key (SMTP password) into the fields and click Save ESP Account. Your Mailjet account is now correctly configured and integrated into Outbound Automation. It will appear both in your Setup dashboard and as a sending option when building a campaign. Note: If you already have any From Lines built into your Outbound Automation account, you will need to enable this ESP for use. Go to Creatives>From Lines and edit your from line. You will see your new ESP as an unchecked option. Once you check your ESP and save the From Line, your new ESP will appear as a sending option for all emails using this From Line. Unlike most ESPs, Mailjet will allow you to schedule an unlimited amount of emails per day. However, if you reach your daily send limit within Mailjet, the ESP will not fail. Instead, it will enter every email that exceeds your daily limit into a pending status. Once your 24-hour limit expires, it will attempt to send these emails again. Because of this, Mailjet will never fail over to your backup ESP. We strongly recommend setting your Mailjet daily send limit in the Setup tab to match your Mailjet daily send limit. For Mailjet’s free account, this is 200 emails/day.